Picton Cottage01263 588337work Self-cateringThis delightful detached flint and brick cottage is set back from the main coast road. It is located within a ten minute walk from the beach and town centre, and a five minute walk from Beeston Common. The sensitive refurbishment combines light and airy modern convenience, with many charming original features. There is a pretty enclosed rear garden, with a chalet and children’s ping-pong table, and off-road parking to the front for two cars. Picton Cottage is an ideal location for exploring the local area, and benefits from free Wifi. 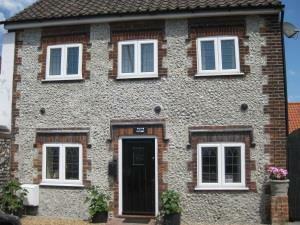 This delightful detached flint and brick cottage is set back from the main coast road. It is located within a ten minute walk from the beach and town centre, and a five minute walk from Beeston Common. The sensitive refurbishment combines light and airy modern convenience, with many charming original features. There is a pretty enclosed rear garden, with a chalet and children’s ping-pong table, and off-road parking to the front for two cars. Picton Cottage is an ideal location for exploring the local area, and benefits from free Wifi. Guests should be aware that this charming cottage is well over 100 years old, and has the low doorways and narrow staircase associated with such properties. Children welcome from any age.